I’ve been happy enough with my mid-range mPower (EU edition) that I bought an mPower PRO (again, EU edition). I finally got around to unpacking it and setting it up. mPower mini, mPower and mPower PRO are Ubiquiti Networks’ IP power outlet product. They run Linux on them. There’s web UI, and it’s also easy to SSH into the device out of the box (username is ubnt and password is ubnt). This makes the device easy to script for: all power use statistics and remote control are exposed as files in /proc/power. An app for Android exists as well. I purchased the mPower PRO simply because I needed a few more plugs to control. 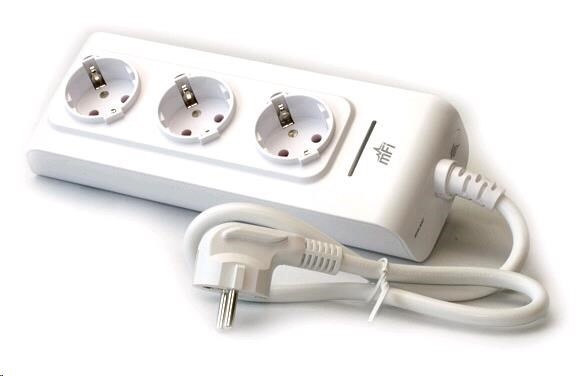 Difference between mPower and mPower PRO is that the latter has six instead of three plugs, and it has both WiFi and an ethernet port (all smaller models have just WiFi). Since my previous post) was originally written in August 2014, I discovered that a newer firmware has a nicer web UI, and changing the default username and password is not really a problem anymore either. So I ended up flashing the device, then factory-resetting it. Given how nicer web UI is important to me, this means this will be the first step with my today’s setup of mPower’s “bigger brother”. The box contains the device, a wall-mount and a small manual. I’m interested in just the device, of course. First difference is that mPower PRO will not bring up a wireless network you use to set it up. Instead, you must connect it via the ethernet port. This is fine; I’m happy that I lucked out and had an extra ethernet cable lying around. Password is, as previously mentioned, ubnt. This will take a while. Don’t unplug the device while it’s being flashed. After a few minutes you’ll probably get something like Write failed: Broken pipe. This is fine. In future, you can use web UI to flash an upgraded firmware. If your device is at 198.51.100.84, then just visit http://198.51.100.84/ and log in with username ubnt and password ubnt. You probably don’t want others to be able to log in with the same credentials, so change them as soon as feasible. On the System tab, next to the field ‘Administrator Username’ and its value ubnt, there should be a small icon of a key. Click on it. Then, change the administrator username, enter the old password ubnt, then enter the new password twice. Then click the ‘Change’ button which is above the ‘Management’ section and below the ‘NTP’ section. You’ll get asked whether to apply the changes. Do apply them. Hooray! mPower PRO is sufficiently ready for basic use. At some point I’ll go ahead and assign port names which doesn’t seem to be doable through web UI. This entry was posted in gadgets, system administration, unix and tagged mFI, mPower, Ubiquiti on July 26, 2015 by Ivan Vučica. Updated 29 December 2014: With the latest software (currently 2.1.4) there is actually a decent, password-protected standalone web UI. I’d recommend you to factory reset the device, set it up from scratch, and set a new username and password from the web UI. You’ll still be able to log in over SSH and telnet, and while I no longer need to access the device directly, I’m sure most of the article below applies. To upgrade from 1.x series software, which is what I had, you should use scp to upload the new firmware to /tmp/fwupdate.bin. To upgrade from 2.x series software, which has the nicer web UI, just use the web UI. Details. After getting the mFI mPower unit, I saw that it really wasn’t planned for standalone use. I was also surprised at seeing no ethernet port; I’m not sure why I thought it’s going to have one. This is a wifi IP power strip that seems to be designed neither fully for a consumer (why would a consumer need a IP power strip?) nor for an expert. After plugging it in and waiting for it to boot, you’re greeted with a new completely unprotected wifi network. After connecting to it, you’re hijacked in the same way captive portals technologies work. It seems pretty painless to configure a device to connect to a wifi network, and then either to cloud or to a local controller — a chunk of proprietary software that, based on the quick guide booklet, seems to be written in Java. Booklet mentions versions for Windows and OS X, but the website offers download for Linux as well. I’m however uninterested in having a home machine run 24/7 and waste electricity just to occasionally control a power strip. I opted for the (for obvious reasons less secure) variant of going into the cloud. Unfortunately, the built-in web UI doesn’t give you an option to register nor a hint on doing so. Quick guide does mention the website, which reveals a login panel but no registration. At least I could configure wifi connectivity without either controller software or cloud — but that seems to be all. That’s because in October 2013 the service was shut down for new registrations, with promises of coming back. Seeing that was 10 months ago, I began to think I may have purchased a brick. Luckily, apart from what’s served to the customer on the surface, the device seems to be rather open. I’m unfamiliar with how free and open source it is, but it seems to be built out of relatively understandable components. BusyBox is there, the usual UNIX-like directory structure is there. I also spotted dropbear, which means aside from a telnet daemon, it’s also providing an SSH service. Default username and password set is ubnt/ubnt. Ouch. First obstacle: How do we change that? We can use vi to edit /tmp/system.cfg. There it is! Username and password. But wait — what kind of a password hash is that? Turns out it’s the output of crypt(3). This gets used to generate /etc/passwd. That’s really nice and flexible. But they could have either documented all this (and in an obvious place), or created a web UI (of course, while letting us deal directly through telnet and ssh, too). To save these settings, punch in save. (Alternative command seems to be cfgmtd -f /tmp/system.cfg -w.) To give the system a chance to apply the settings, reboot. What I also like in this device is that it seems to have the Linux-friendly Atheros chipset in it. So next. How do we actually read stats or switch an outlet on or off? Other functionality is demonstrated and explained by forum member Sequim. And the /proc/led directory contains some nice controls for the LED. Really lovely design. It’d have been even nicer if it had been properly documented and if it had a proper web UI shipped in case you don’t feel like dealing with all the power that these controls exposed as a filesystem provide. This entry was posted in gadgets, system administration, unix and tagged mFI, mPower, Ubiquiti on August 7, 2014 by Ivan Vučica. I’ve switched the server to nginx. I don’t have too many htaccess-based rules, and overall the Apache2 configuration was very simple to begin with. I installed php5-fpm, followed tutorials on configuring nginx (moving what’ll be common among 15ish virtual hosts into a separate file), configured proxying for XMPP BOSH and finally improving SSL security. Apache2 now sleeps quietly and the RAM usage is down a bit. Hopefully the server won’t suffer any more hard crashes due to lack of RAM like it did immediately after I moved to the new host. Overall, nginx seems like a much lighter and easier to understand solution for my very simple needs; if you’re running a simple server, I recommend it (as long as you read a bit about its security, if you intend to use it for serving PHP!). This entry was posted in system administration, web development on December 9, 2013 by Ivan Vučica.